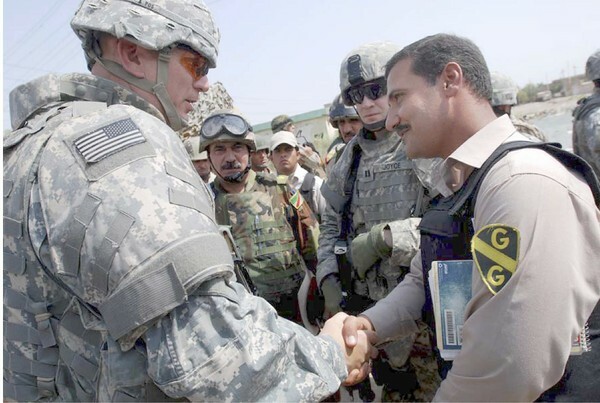 Professor W Andrew Terrill, Research Professor of National Security Affairs, Strategic Studies Institute, US Army War College, has a good history of the Sons of Iraq program, including the near and present danger that Iraq faces by refusing to make good on the promises to the Sons of Iraq. The Washington Post gives us an even more personal account of the evolution of this fated program. After cataloging the exploits of one particularly powerful and renowned insurgent, the fall from grace hits hard. They were polite but insistent; he, the wounded Yasser and another brother had to come with them. Khalil asked to change into a clean gown known as a dishdasha, then sent word to another brother, Shaker, to tell militiamen loyal to him not to start trouble. He was taken to neighboring Balad, where, Khalil said, cheering members of the Iraqi security forces began shouting slogans for Moqtada al-Sadr, a Shiite cleric. Loyalties in Thuluyah are mercurial and suspicions entrenched, even more so since the arrest of Khalil, whose absence has emboldened his rivals and confused his supporters. Maliki, in no uncertain terms, said that Khalil “will be released.” But as Jabbouri, a critic of Khalil, pointed out, the future tense can be rather indefinite. In the town, residents once too fearful to speak have begun airing their resentment of Khalil’s past. Some suggested that Osama bin Laden had bought Khalil the Nissan Armada parked in his driveway. Others, even his fellow tribesmen, blame him for hundreds of deaths in 2006 and 2007. As a way of explanation, they contend that he was al-Qaeda in Iraq’s fifth-ranking leader. Only that much bloodshed, they insist, would have delivered him that much power. To Khalil’s supporters, his arrest was simply motivated by politics, prompted by Sunni rivals fearful of his promised run for parliament in elections to be held by January. Even Hammoud acknowledged as much. Hammoud’s brother sits on the new provincial council, and the new governor belongs to the same party. “Now with the situation in Iraq, everyone wants to win, everyone wants to prepare for the next elections. Every party — how do you put it? — is already challenging the other,” said Shaalan Mohammed, a friend of Khalil’s, sitting at his house. Khalil’s brothers Shaker and Maher nodded their heads in agreement. Hammoud said the town’s mayor had warned him not to file charges against Khalil because the U.S. military last year had declared Khalil “a red line” — untouchable. But these days, U.S. military officials are less generous. Another spokesman denied that the military had ever given him an amnesty, as Khalil claimed. Military officials now say he played no role in the Sons of Iraq, even as fighters in Thuluyah maintain that he is still their leader. “We do believe Mullah Nadhim’s arrest is a matter for the government of Iraq and are confident he will be treated fairly under Iraqi law,” Maj. Derrick Cheng said. At the city council, long considered as corrupt as it was impotent, some members once too meek to offer anything but praise for Khalil have assumed a newfound swagger. Jabbouri, a lawyer and former general who was one of the few to speak out about Khalil, sat under a lazy fan, exuding the sense of someone proved right. Asked if he was happy about Khalil’s arrest, he paused for a long moment. The opinion expressed by the Major Cheng is stolid and dangerous. It’s stolid because not even citizens in the U.S. are always treated fairly under the law. No one believes that all citizens of any country are always treated fairly and with justice. It’s dangerous because if the Iraqi people hear and believe the idea that we believe that all jurisprudence in Iraq is fair and just, then we’re in the pocket of the Iraqi administration and have lost all power and authority. It would have been better to say nothing at all. A whole host of bad decisions has led up to this point. Professor Terrill believes that the worst decision in the campaign was the dismissal of the Iraqi Army. I strongly disagree. Moqtada al Sadr was actually in the custody of the 3/2 Marines in 2004 and released because command pressed for it. Sectarianism is alive and well in Iraq, and leaving Sadr alive was, without any competition, the worst mistake of Operation Iraqi Freedom. It may yet cost us the campaign. Second, I worry about the cost to our souls of the betrayal of the Sons of Iraq. We have too easily amended the public discourse in America to fret over the moral fidelity of enhanced interrogation techniques that were applied only to a handful of terrorists. That promises were made to the thousands of Sons of Iraq is not important to us, and yet it says something very profound and deep about our honesty, integrity and continued support for an administration in Iraq that is as sectarian as is the culture. It says something when we are able so quickly to dismiss and betray those who fought alongside us against al Qaeda. Finally, the Anbaris and Sunnis in other parts of Iraq will not forget, and since this is probably not the last counterinsurgency campaign we will fight in the twenty first century, we had better hope that the balance of the world forgets our broken promises. The next “awakening” may be much harder coming.